Eating in Portland, Maine was so so great! The seafood here is remarkable and there are so many great restaurants. We only had 2 1/2 days but squeezed in as much food as we could. We did eat 2 lunches per day. =) Special thanks to Siobhan, Laren, Hilary, Julie, Scott, Dorothy, Doug of Green Designs (we just walked into his store), girl sitting next to us at Yosaku, and Abbie, our waitress at Fore Street for all the great suggestions for Portland, and for making me wish I had more time to eat more of them. I just want to make the observation that business in Portland love having the words “Street” or “Co.” in their name. I noticed Fore Street, Flatbread Co., Standard Baking Co., Brown Trading Co., Beale Street Barbeque, Portland Pie Co., and Old Port Candy Co. There was a home store that didn’t feel the need to use other words, just named Company, and then a restaurant called Street & Co. Also, I have to say that everyone in Portland in so nice and friendly. Thank You. Starting with a simple salad of endive, cherries, and ricotta, we got a sense of how fresh their ingredients were (though cherries were not that sweet). Then, we moved on to our charcuterie plate (you choose 3 out of a list). 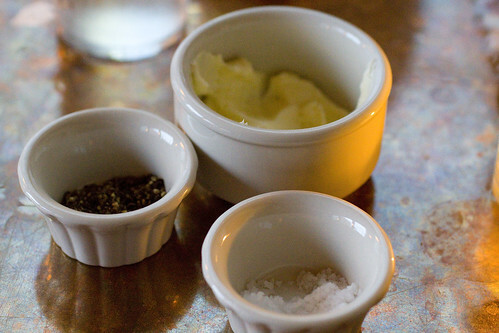 The wild boar rilletes should be called pork butter. The oxtail terrine is for the beef lover. 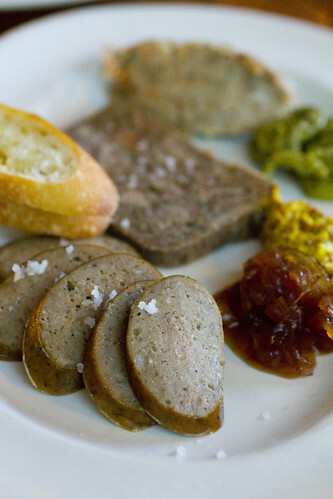 The duck sausage was our fave, rich but clean. Each one tasted like the appropriate animal and the accompanying onions, mustard, and pickled fiddleheads were perfect condiments. The artichoke pizza was great, but I have a hard time thinking of it as pizza. It’s more of a vegetable flatbread (perfect elastic dough) with a red pepper spread and artichokes all over. Though there menu changes daily, they always have a few repeaters like the perfectly roasted mussels, in an ultra garlick-y broth. 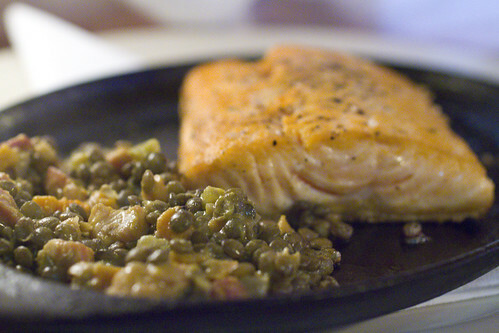 The Arctic Char was cooked just as we asked, rare, and it was simply one of the best pieces of fish we’ve ever had. The lentils are spiked with bacon, a worthy side. We had a side of morels, and a side of green beans with bacon and chickpeas, clearly too much food for 2 people. We had one cocktail and the bill was only $105.43 (before tip) and we agreed that we’d be regulars if we lived in Portland. Because you need something with fiber on vacation. Lon is lactose intolerant so when I got ice cream, he got smoothies across the street. It’s a very cute juice bar with tons of options at average prices. They use a good yogurt that doesn’t over-power the fruit flavors and offers some creaminess. Chowder House that makes less than exceptional chowder. Gilbert’s Chowder House is a name that gives away what you specialize in but we didn’t think their chowder was all that great. It’s very heavy on potato and something gave it a powder-y texture. The bread they use for the bread-bowl is also laughable, supermarket quality bread, especially when we know Portland has some excellent bread. 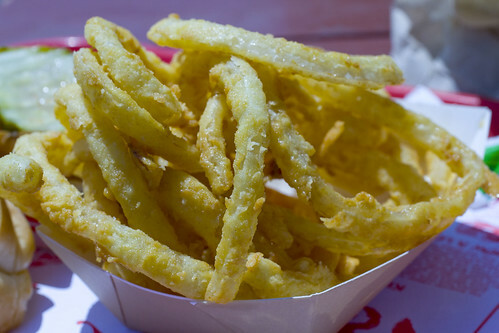 More things should be fried in duck fat. When I announced our trip to Portland, everyone shouted Duck Fat 43 Middle Street, Portland, ME 04101! Their poutine is absolutely awesome. There’s a bit of a worthwhile wait because they make it to order. The potatoes are fried in duck fat, topped with Silvery Moon Creamery cheese curds and their duck gravy. I would call their gravy something between gravy and jus because it’s not that thick, but delicious and works! Best Poutine! There, I said it. Get a large for $9. The beignets are a also freshly fried but a bit too dense. 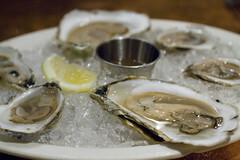 We started with wonderfully fresh oysters which went so nicely with my glass of domaine chiroulet cotes de gascogne. The oysters in Maine have just been much better than any that we have had in NY. 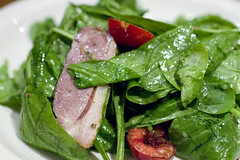 The salad of spinach, cherries, and duck was clean and simple. The duck was very duck-y (in the words of Tom Colicchio). They had a special of Orecchiete with a Tuna Bolognese and I almost ordered it just to challenge them. I didn’t think it would really work but this dish was delicious. The pasta was cooked a little past perfect, but the flavor of this lightened version of a classic meat sauce was so addictive that I couldn’t stop eating it. The star anise really made this dish feel meaty yet it didn’t feel like cheating, the way “fake-meat” often does. I hope they put this on the permanent menu. They offer a Clam in White Sauce and a Calamari in White Sauce pasta and Lon wanted both so he asked for it to be combined. 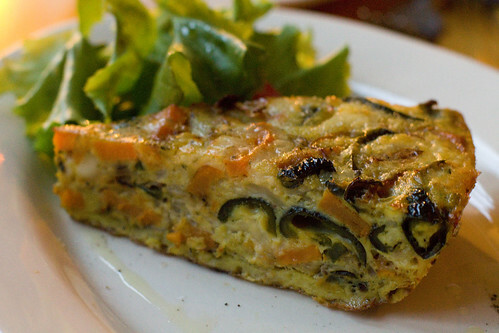 Heavy on garlic, fresh and fried, light on basil, and perfect in every way. 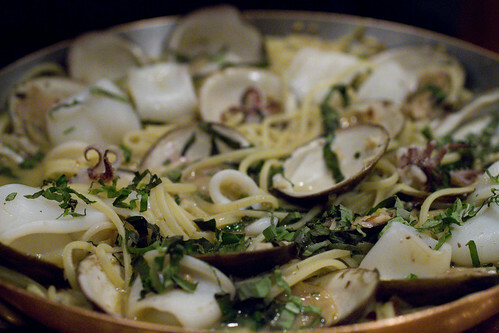 The clams and calamari were fresh and tender, the sauce was brothy and ready for dipping, the pasta was al dente. It was such a soothing dish that I could eat regularly. It came to $71.53 (before tip) and this was another we’d be regulars of if we could. If you have sushi where you live, you don’t need to waste a meal here. Yosaku 1 Danforth Street, Portland, ME 04101 is not terrible, but not great either. It’s just another average sushi place, where the only memorable piece was the Blue Prawn, body served raw and head deep-fried. The rolls here have way too much rice and it’s not seasoned sushi rice. They use really low quality wasabi. It’s one of those quantity over quality places, and you don’t want to do that with sushi. Lunch for two of us was $60 (including tax and tip). There’s always room for ice cream. Beal’s Ice Cream 12 Moulton Street, Portland, ME 04101 kind of wins in my eyes just for making Oreo Coffee, which I don’t find often enough. I used to eat the one from Turkey Hill a lot as a kid and that flavor is near and dear to me. It didn’t surpass expectations though and could use more cookie, but still I scarfed it up. The Banana Cream Pie has a wonderfully natural flavor. I’d have to eat this again on my return to Portland one day. Two giant scoops was something like $3.85 -awesome. It just makes sense to eat lobster sea-side. There’s a Lobster Shack 225 Two Lights Road, Cape Elizabeth, ME 04107 at Two Lights Park, a short drive out of Portland. You order the food inside and bring your tray out to the picnic tables, where you can eat and watch the waves. 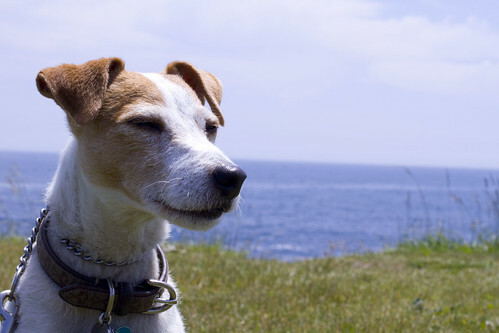 I loved being under the sun while a cool sea breeze blew by. Eating here just makes you feel like you’re really on vacation. 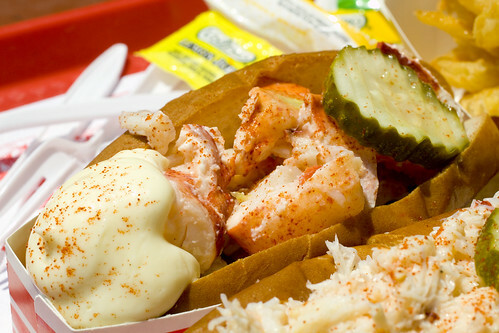 It’s a little wierd that they put a giant blog of mayonnaise on the side of the lobster roll. I guess it’s to mix it in yourself so you can adjust to your liking. Both lobster and crab rolls are very fresh but I don’t like that they put shredded lettuce on the bottom. You get some bites full of lobster or crab, and then another bite of lettuce sandwich. Not our style of pizza. Flatbread Co. 72 Commercial Street, Portland, ME 04101 makes their own version of pizza which is pretty much pizzza with a softer dough. Lon hated it, especially how little sausage was added. I can’t really defend it because while I didn’t hate it, I didn’t particularly like it either. A lot of dried oregano on average pizza. The good, the bad, and the mostly average. Local 188 685 Congress Street, Portland, ME 04102 is a confusing place. It looks like an artists living room, only really big. There menu is set-up to look like a tapas menu yet many dishes are really Italian dishes, and even some other random ones, like shortribs in a barbecue sauce. Lon actually loved the shortribs but the other dishes fell to mostly mediocre. We ordered a Moro bread because I figured that when you’re charging for bread, it shoudl be spectacular. Well, it was not and didn’t even taste fresh. The gnocchi was so bad, like rubber balls that were pan-fried on one side, but seeing that we barely touched it, our waitress asked us and took it off our bill, which was $75.97 (before tip) for bread, tortilla, mushrooms, short ribs, tagliatelle, paella, and a glass of wine. Our plan was to pick up breakfast at Standard Baking Co. 75 Commercial Sreet, Portland, ME 04101 before leaving Portland for the long drive home. I was planning on buying just a breakfast, a healthy sized one, but ended up leaving with an Apricot Almond Scone, Ham and Cheese Croissant, Cherry Cheese Tart, granola bar, morning bun, Marinated Olive Roll, Seeded Fougasse, and a giant Miche. Oh, and great coffee, all for $22.94 I loved everything. So fresh, the sweets were not too sweet, the rich was not greasy, and no surprise that it’s yet another place associated with Fore Street and Street & Co. They remind me of a rustic version of Bouchon, but with better prices. The only thing their missing is a website and a location in New York! Please! I grabbed coffee at Coffee by Design 43 Washington Avenue, Portland, ME 04101 one morning and didn’t like it, too acidic for me. They offer a different one each day so it could have just been my luck, but it’s also a messy looking little place and doesn’t have seats. The next day, I got a cappuccino from Bard Coffee 185 Middle Street, Portland, ME 04101 and it was satisfactory but I wouldn’t remember it. It’s a much cleaner and newer looking space with a lot of space to sit. I could comfortably do some work here. The last morning, I got coffee from Standard Baking Co. (a blend made for them but don’t know by who) and it was awesome! Leroux Kitchen 161 Commercial Street, Portland, ME 04101is a great 2-floor kitchen store in Old Port that we happened into. We bought some of our beloved Maine Sea Salt Co. salts and some blueberry jams and syrups. They have a ton of vinegars and olive oils to sample, and a wine section as well. We stayed at Portland Harbor Hotel 468 Fore Street, Portland, ME 04101 while we were in Portland and it’s a nice looking hotel in a very convenient spot, right on Fore Street in Old Port. Most of the restaurants we wanted to go to were right there within a few blocks away. The first night, Lon couldn’t sleep because of the noise coming from bars near by so we moved to the garden-side for the last 2 nights which was much better. They do allow dogs here but it was no where near as pet-friendly as The Colony Hotel in Kennebunkport. *Special thanks to our travel agent/twitter friend Erina at Smart Flyer. posted by jessica	at 01:05 PM	Filed under Restaurants, Travel. You can follow any responses to this entry through the RSS 2.0 feed. Both comments and pings are currently closed. 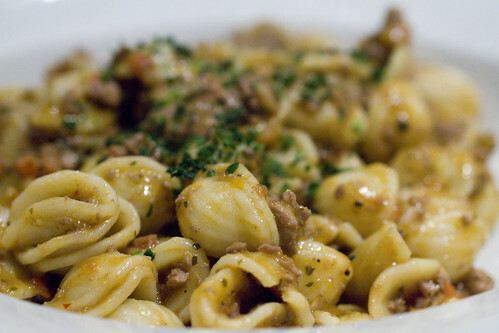 We regularly enjoy wonderful meals at Local 188 and love the way the staff is able to talk knowledgebly about the food. If you are in Portland again, do give it another try. We have never been disappointed and love the lively atomosphere with people of all ages. Judy, I did notice a very surprising mix of ages and I like that too. Bob, that’s interesting. The reviews of them look good, but since they serve a different coffee every day, I didn’t like the one I got at their own location. I like the concepts at Roasting Plant (NYC) and Philz (SF) because you can find the blend you like and get it whenever you want since they make each cup to order. Interesting that Lon is lactose intolerant, as I am also. Away back when I was about 12 (72 yrs ago)my mother insisted I drink a full 12 oz glass of milk. She was adamant, milk is good for growing boys!! Well, I did, down the hatch! About 5 minutes later, up it came! Along with everything else I had eaten, all over the floor. That was the last time she insisted:-)! We now are able to get a lactose free/sugar free ice cream in a variety of flavors. Oh Boy!! We do use Lactaid milk for cooking and baking, and I can tolerate hard, cheddar cheese. Cream cheese, yogurt just kill me, yogurt makes me ill almost right away. Funny though, buttermilk is fine, I can even drink it! Strange, these allergies, huh? eatingfoodboy, not that much, but we did shop in Freeport and we went to Quarry Dog Run with Ice, which is the best dog run ever!